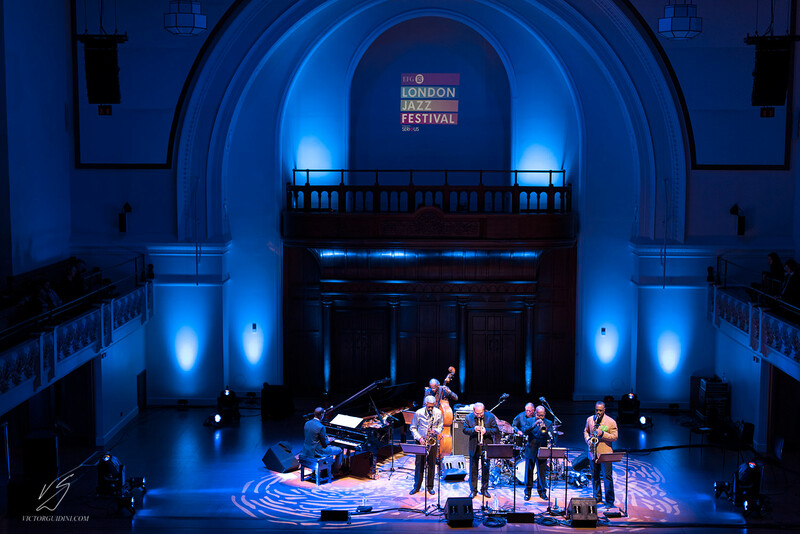 As if to emphasise the fickle nature of the London jazz audience, this potentially impressive double-bill attracted barely 60% capacity. Earlier LJF concerts had been near-full at this imposing venue; doubtless there were other competing events, but nothing of this apparent magnitude. Oh well. So what did the missing multitude miss? First off, a set by Chico Freeman’s brilliant quartet that surpassed expectations and second, a presentation by the Cookers that somehow fell short of their very best. More anon. 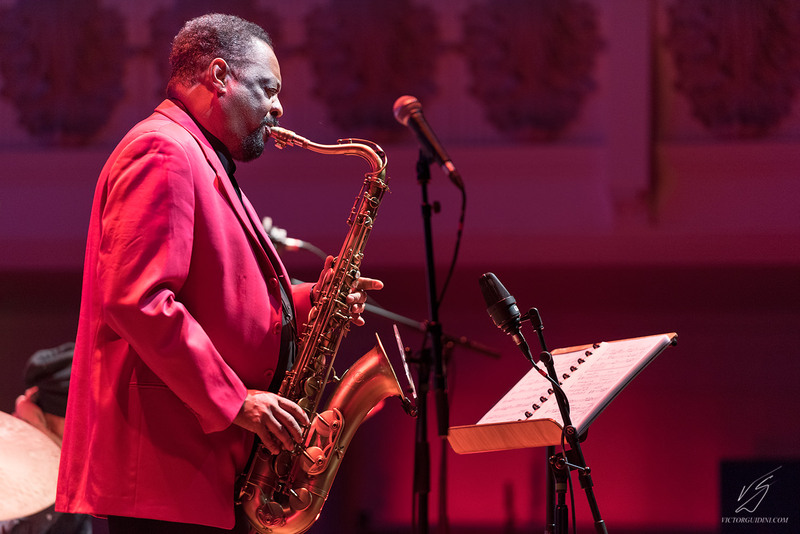 Long one of jazz’s wanderers - Chico Freeman returned to the United States in May 2016 after more than a decade living in Europe - the 67-year old Freeman, as he reminded us, had been an absentee from London for quite a while and seemed genuinely glad to be back. His latest band, the Plus + tet, has been touring the US behind a new album Spoken Into Existence’ and this version brought into focus the experienced Chicago bassist Kenny Davis, plus new find pianist Luke Carlos O’Reilly and the dynamic young drummer Michael Baker. An opening number based on bombast, with Freeman channelling Coltrane in a turbulent solo, Baker out-gunning Elvin Jones in the racket he offered, suggested a hard road ahead. Happily, the set took on a more settled feel with Erica’s Reverie. Named for one of Chico’s five daughters as he told us, this lyrical piece took Freeman’s tenor into softer territory, eloquent and poised, O’Reilly’s perfect piano alongside, the quartet’s intensity building. Freeman is very definitely his own man, a view consolidated with his To Hear A Teardrop In The Rain, this prompting a sumptuous tenor solo, its soulful development recalling Freeman’s roots in Chicago blues. A rousing up-tempo piece to finish and he was gone. 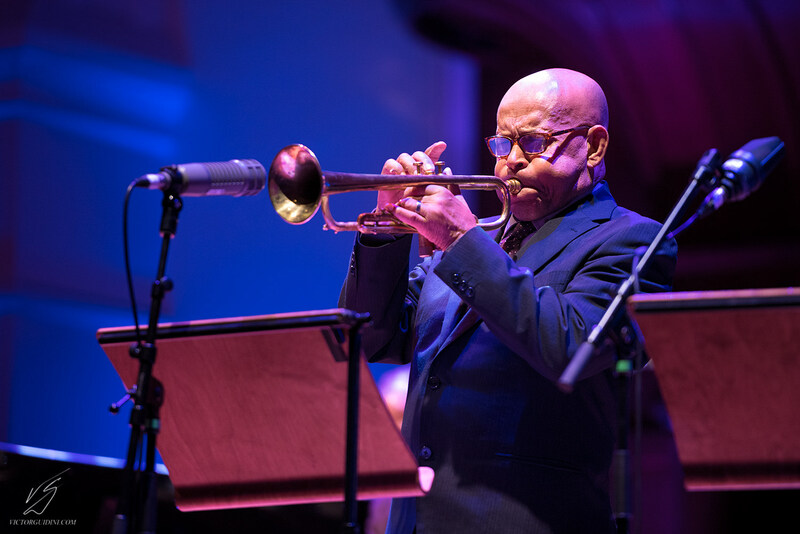 Far more than just another Coltrane disciple, Freeman remains an exciting contributor as both soloist and composer. He needs to be heard. The all-star Cookers were making their concert debut in London, a relishable prospect, for sure. On-stage amplifier problems with Cecil McBee’s bass seemed to take an age to resolve, the Cooker bandsmen hanging about and looking askance as they waited to get underway. Whether this freaked them out or not, their set had an uncertain feel, not helped by a sound balance that gave priority to the veteran Billy Hart’s hyper-active drumming and muddied the ensemble passages, this evident on the opening modal piece, with tenorist Billy Harper struggling to be heard, his playing ever more distorted and clamorous. McBee’s Peacemaker settled things down, allowing the 76-year old trumpeter Eddie Henderson a decent blow although his finest moments came later on Harper’s If One Could Only See where he was heard at length, pungent yet poised, with pianist Danny Grissett excelling, as he did throughout, especially on another Harper composition The Call of the Wild and Peaceful Heart. This was a quite solemn affair, allowing bandleader David Weiss to demonstrate his fluent trumpet attack and harmonic nous, his lines extending cleverly in the manner of Freddie Hubbard. The Cookers used The Corner, a Hubbard original, as their closer, this a solid riff piece, that featured a an extended solo by Hart, and finished well, making one regret that their choice of repertoire had not stayed closer to their hard-bop affiliations . Not at their crisp best, perhaps, on this occasion, the Cookers combine a reservoir of experience with a still-alive sense of adventure. I’d like to hear them again. Thanks to the eagle-eyed reader who pointed out an error in our photo caption - Craig Handy replacing Donald Harrison on alto. Now amended.